Otis Reese is grateful his favorite deli has a surveillance camera. He says it saved him from what could have been years in prison after NYPD cops stopped the 30-year-old for walking down the street with an open beer. It was unopened in a brown bag, Reese told the I-Team in an exclusive interview. Reese has filed a $1 million notice of claim against New York City, claiming he was falsely arrested for a bogus reason and then illegally searched in March of 2016. Reese said he had bought beer down the street, then walked with the closed bottle in a bag to New York’s Finest Deli on Third Avenue in the Melrose section to buy a sandwich. Reese said as he walked into the deli, he noticed two uniformed NYPD officers in an unmarked vehicle pull around the corner and park across the street. 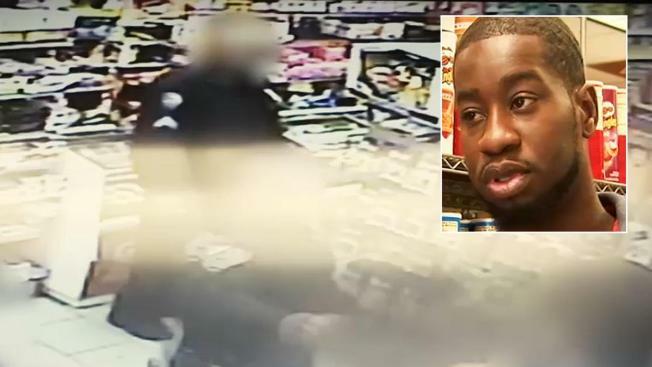 Surveillance video corroborates Reese’s story that he placed the bag on the front counter of the deli so the owner knew he had purchased it somewhere else. The video shows the two officers, an officer and a sergeant, enter 20 seconds after Reese walks to the back counter. One of the officers later testified at a pretrial hearing that he had seen Reese carrying an open container on the street and never lost sight of him as he placed the bottle on the counter. The video shows the officers walk right past the front counter and head directly for Reese. He said they asked him where the beer was. The video shows one of the cops return to the counter, where he grabs the bag. Said Bruce Birns, a former Bronx D.A. prosecutor, now a defense attorney, "You see the arresting officer twist what appears to be the top; the top remains intact. It doesn’t come off. It was never opened. There was no basis for the stop for an open container." Reese said, "They came back and said I’m going to jail for an open container." Reese was handcuffed and later strip searched at PSA 7. Officers said they found several baggies of drugs and charged Reese with multiple felonies. Defense attorney Birns said he repeatedly requested the surveillance video but received only a portion. It did not contain the arrest inside the store or what happened when the officers left the deli, but Reese said what it does show cleared him. "I think the video made a real big difference because it shows clearly what the police do, set people up," he said. He denied that he had drugs. Birns said he asked for prosecutors to turn over the bottle. "I was told basically the police don’t know where the bottle is. The officers in this case never vouchered the bottle, never took a picture of the bottle. To me that is totally irresponsible. One of the reasons alleged was that you can’t bring alcohol into the precinct. Are you kidding me?" In July, one of the officers testified at a pretrial hearing that he could tell the bottle was open because he did not see a cap on the top. A judge wrote that the surveillance video contradicted that testimony: "This court rejects the officer’s testimony because it is absent logic." "It is clear that upon the officer 'twisting the cap' it does not move, let alone lift or come off the bottle," adding, "The officer could not explain why the surveillance footage clearly shows the defendant enter the deli with a capped container." The judge ruled that none of the evidence recovered by the NYPD could be introduced by the DA’s office at trial. In August, the DA’s office dismissed all the criminal charges against Reese, who said he turned down offers to plead guilty to reduced charges. Reese said he believed he was targeted because he had a prior run-in with the sergeant on the street and filed an internal affairs complaint. Both the NYPD and the DA’s office said they couldn’t comment on the case because it is now sealed but representatives told the I-Team the officers involved are not under investigation. "I was a target before and I’m going to be a target now," said Reese, "but I’m willing to speak out for the people that don’t speak out." Birns said, "I don’t know how anybody could look at this video and make a decision they wanted to pursue it. It was a patently illegal arrest that lasted in a two and a half year prosecution borne out of either indifference or obliviousness."